The lightweight, transparent Wingabago® carrier for birds and exotic pets gives your pet a clear view of their surroundings and allows you to monitor their safety quickly. 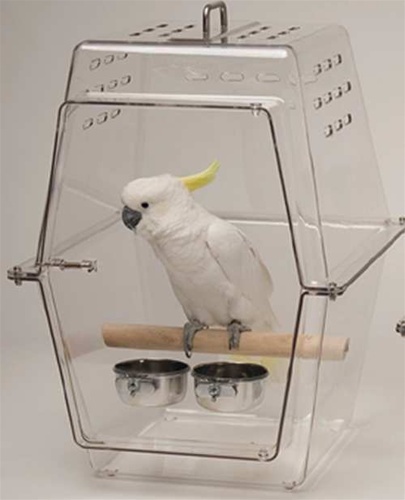 Birds do not feel trapped or claustrophobic in the Wingabago® . They can see out and you can see in. 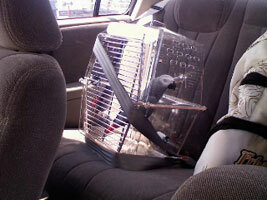 Veterinarians consulted indicated bird experience less stress during travel if they can see their owners. The Wingabago® is made of FDA approved, food grade plastic, which is stronger, more resilient and lighter weight than acrylic carriers of similar size. The Wingabago® is easily secured in the car by using your car's seatbelt system. All the mess is contained inside the carrier, not all over your car. Keeps curious beaks contained. They can't chew through your armrest, seat belt strap or car upholstery. We've heard stories! Easy to clean. There are no seams or right angles for poop to get stuck in. All corners are rounded. Won't damage you or your car. There are no sharp edges to scratch or gouge you or your car upholstery. Birds can perch naturally. The perch is high enough off the bottom of the carrier that most birds can perch with their tail off the ground, and, the perch is low enough that if they fall off the perch, they can get back on. The Wingabago® protects your bird from drafts from wind and air conditioners. The Wingabago® carrier nest in two halves reducing required storage space when not in use. The most important feature is that birds really love their Wingabago® . They can see everything going on around them, but they feel safe and secure inside their WingabagoÂ®. Comfortable bedroom. We were surprised to learn from many Wingabago® owners that their bird sleeps in their Wingabago® . Mess Free Dining Room. Some birds are just like babies. Food everywhere. Mealtime in the Wingabago® contains the mess, and makes cleanup easier. Soothing Sick Room. Keep sick birds warm and calm in their Wingabago® . It also keeps sick birds quarantined from healthy birds. The Wingabago® comes with everything you will need. Both size carriers come with 3 dowel perches (3/4", 1" and 1-1/4"), 2 stainless steel food and water cups, the all important toy hangar, and a travel safety guide. SHIPPING NOTE:Free Shipping to Continental United States Only (Ground); Please contact us for accurate shipping rates to other locations or if you need Expedited Shipping (FedEx Express). My Triton Cockatoo loves his Wingabago. He traveled for 13 hours from NC to NY without one scream! I think he likes the feeling of not having bars between him and his human flock. When he is out of his regular large cage, he often walks over and gets into his Wingabago. We are considering buying a large acrylic cage for him, simply because he is much quieter and more content in the Wingabago. I bought this carrier for my Moluccan Cockatoo, and it is roomy enough for her to move around a little bit and play with a toy while she is in it. She seems to like it, and I think it's because she can see everything while staying safe inside! I got this for my Umbrella Cockatoo, Alfie. She chewed out of the old carrier that was really meant for dogs and cats. She has not been able to chew it and she enjoys the view she has now and does not scream for us all the time. 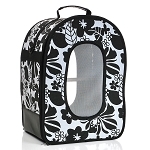 I bought another one for my African Grey, Ali'i so he would have the same advantage she has when they are in their travel cages. I got a good price for both and the shipping was quick. I got a call from the store when they noticed that I had purchased the stainless doors seperately and was offered the option of combining the shipping for the second cage and the two doors to save a little money. Thanks for looking out for me on the shipping, guys. You will be highly recommended and remembered in the future for any other purchases that I make for my birds.Thanks for caring for birds and having products that are safe for them. Service was fantastic - received my order very quickly! Q: Is this travel cage big enough for a large macaw? A: It would be if you don't mind a bent tail! The other option is the Large Perch 'N Go carrier -- that allows a long-tailed bird like a macaw more room horizontally. Q: outside dimensions of both Winnabago carrier sizes? A: Dimensions for both carriers are listed in the Description. Q: I purchased a Wingabago about 2 years ago. My Triton Cockatoo absolutely loves it! He prefers it to his very large normal birdcage. My questions is, do you make an even larger one, or have you ever considered doing so? I can imagine that he could be happier being able to see the world without bars on a daily basis and a happy cockatoo is a quiet cockatoo! A: That would be a question for the manufacturer directly -- given the steps involved in design and getting an overseas factory geared up to make a new size I think would be difficult, but you never know. I would also think that larger size might not be airline approved so that would weigh in the decision. You might do an online search for "acrylic cages" - as I think there are companies that do make those - though I would be concerned about airflow for long-term use of one. Q: Which size Wingabago would you recommend for a Blue front Amazon parrot? A: You can see the photo shows an Amazon in the Small carrier, so it would be fine, but if it is an extended say in the carrier, the more room the better.